Turkish Vice President Fuat Oktay travelled to Venezuela on Wednesday to attend the inauguration for the second term of Nicolas Maduro’s presidency on Thursday, the Venezuelan government website reported. Maduro, who reached the presidency through a snap vote after his predecessor Hugo Chavez’s death in 2013 clung to power in elections last May with 68 percent of the vote, despite a desperate economic situation in the country that has seen severe shortages of staple goods and inflation topping 1 million percent last year. Doubts have been cast on the validity of the election, which had a low turnout and was held amid a government crackdown on dissenting voices. However, the New York Times noted, the chaotic situation may have strengthened Maduro’s position in the vote, as poor voters were offered much-needed government incentives in the form of food handouts. While in USA Today’s words, “a dozen Latin American countries and Canada have rejected the legitimacy of Maduro’s next term,” the socialist president has the support of left-wing governments in Cuba, Bolivia and Mexico. Among these socialist and left-wing states, Turkey’s conservative nationalist Justice and Development Party (AKP) government may seem an unlikely addition to Maduro’s list of allies. Yet the two countries have enjoyed close ties in the recent past, despite the ocean and ideological rifts that separate them. Maduro and Turkish President Recep Tayyip Erdoğan met last December, providing yet another occasion for the Turkish leader to slam the United States, this time for its sanctions on Venezuela. Erdoğan’s interest in those sanctions is derived from more than mere concern for a troubled friend. In the first nine months of 2018, Turkey imported $900 million worth of Venezuelan gold, one of the items forbidden according to the sanctions. 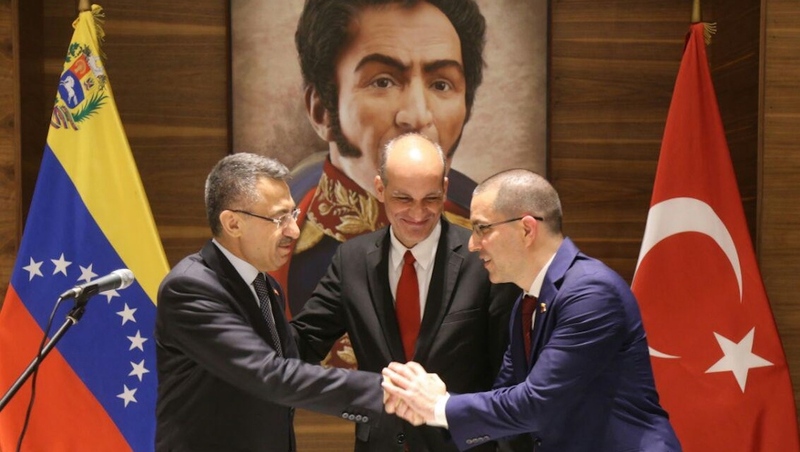 Turkish companies have benefited from trade going the other way to the extent that one of Turkey’s two largest business associations has opened an office in the Venezuelan capital city of Caracas.